Made from solid one piece genuine leather, these handsome belts are perfectly suited for any outfit, whether it's casual jeans or dressy slacks. 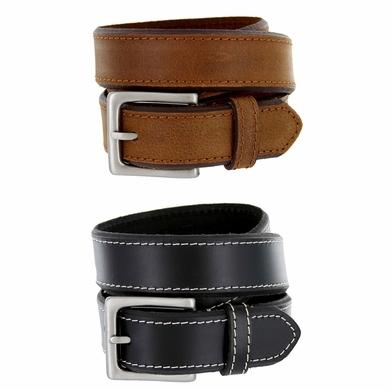 Distinctive beveled edges, along with a bar tack stitching accent along the border, make for a great stylish belt. Available in Black with contrast stitching, or Brown with matching stitch. Match with your wardrobe and shoes, or get one of each color to go with anything! Real leather means no glue and cardboard, polyurethane fillers, etc. This belt can hold up to every day wear and won't split or crack on you. Sizing: This style is 1" short so please order the next size up. Measure around where you wear the belt and order the next size up.